The Regulator gloves by Black Brand are a good choice for fall and spring. 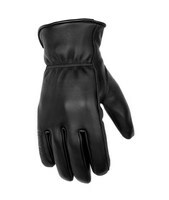 They are lightly insulated and the outside of the gloves is soft deerskin… my favorite. Black Brand says: A classically styled riding glove made from deer skin for comfort and Thinsulate™ with fleece for warmth, the Regulator will be your go-to winter riding glove.